Goonhilly Earth Satellite Station in Cornwall, UK , and the iconic Arthur satellite dish, brought Britain into the space age. 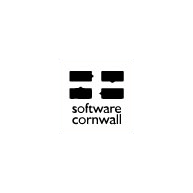 It enabled transatlantic broadcasts for the first time, carrying broadcasts of Neil Armstrong’s first walk on the moon on July 20 1969 and modernised communications with the rest of the world. 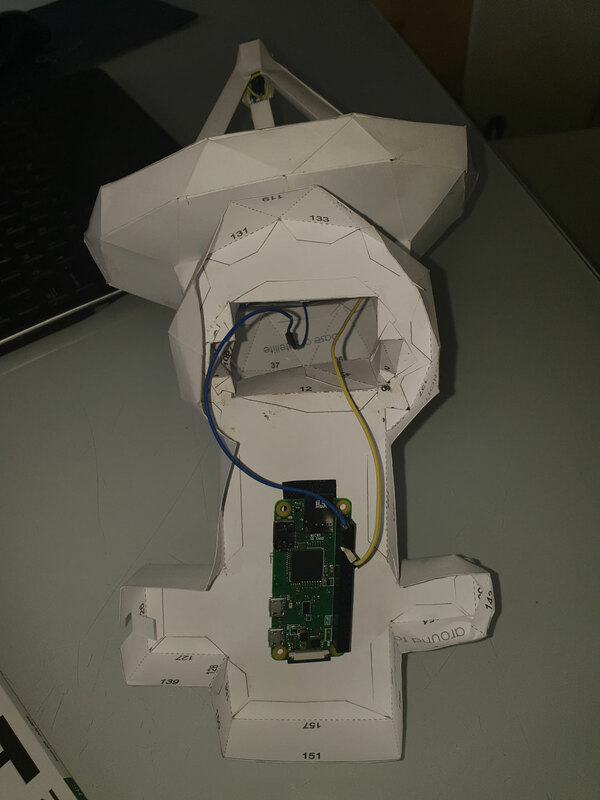 Project_Arthur is a fun project allowing you to construct a 3d paper model of the dish which will track the location of the ISS (International Space Station) using an embedded Raspberry PI and notify you when it is over your chosen location! 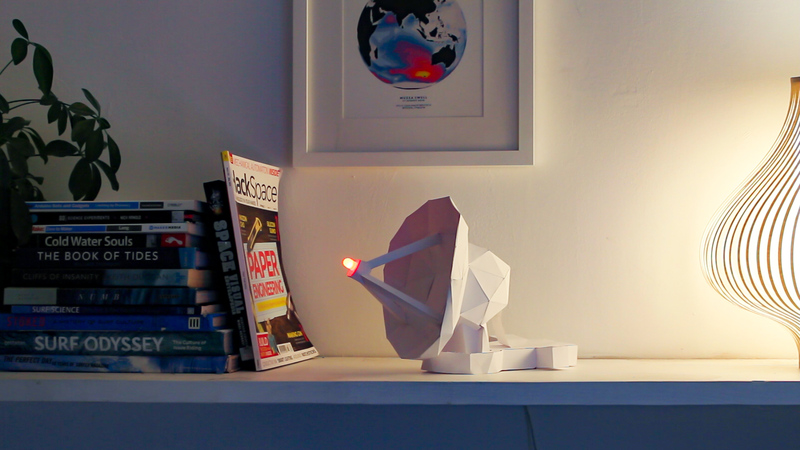 The 3d paper model contains a RaspberryPI, which is a clever inexpensive microcomputer that is connected to the internet. 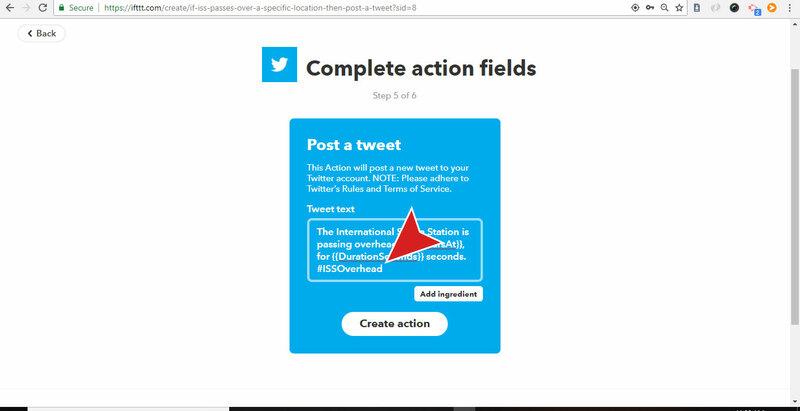 The project uses a conditional web applet that we create on the IFTTT (If This Then That) https://ifttt.com/discover platform, the applet monitors an API via NASA and Open Notify that we give a specific location on Earth(like your house/school etc), it will then compute when the ISS will be overhead and then send a tweet to your Twitter account accompanied with a particular hashtag such as #ISS_overGoonhilly when this is picked up by the code running on the PI the LED will flash to indicate the ISS is overhead! It is a great project for all ages to learn a range of skills such as physical computing, programming, basic electronics, and papercraft! The model requires around 2-3 hours build time and can be complex in places. I hadnt built a paper model before with this level of complexity and i had to reprint a few parts before getting it right and i learnt some very handy tricks to make it easier for you build. There are plenty of YouTube tutorials to learn paper craft but sofsdesigns.com who helped create the model has the best support for the design on her website here. The model needs to be built in reverse so start with the largest number and build back to 1. If you are building with younger children use the larger model. Use a craft knife to cut the parts and the back of the blade to score the fold lines. Make sure your hands are clean as its very easy to transfer dirt onto the paper when mixed with the glue and create a mess. 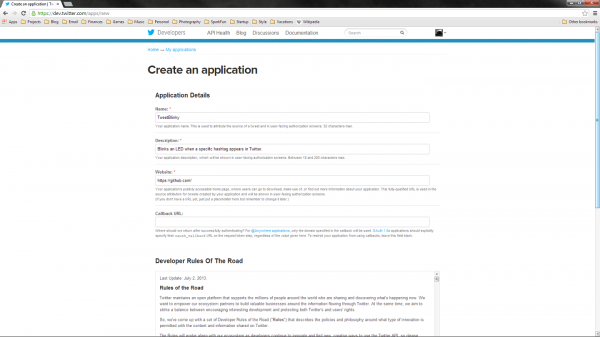 Apologies for those that have been waiting for this part…this web page went live a little earlier than i expected. So…The Raspberry PI Zero is housed inside the completed model in the base. I used some Velcro tape to attach it to the model. A little cut out for the USB power lead can help not topple the model and using one of those soft silicone leads can stop the wire lifting the model. 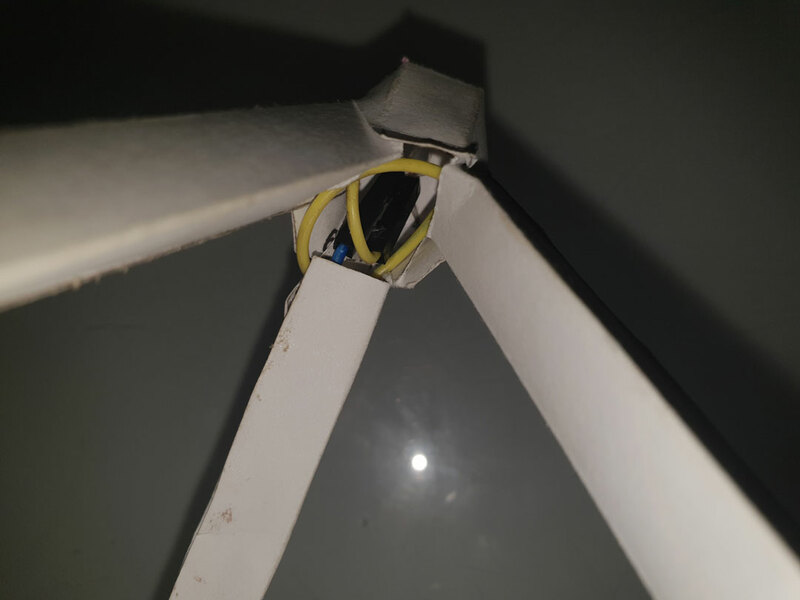 I used a dob of hot glue to attach the LED to the base of the antenna arms and then slid the jumper connectors onto the legs of the LED. The threading of the wires through the antenna arms i found a little tricky but this was because of the connectors in the jumper cables so i recommend you use the correct length of wire to simplify the routing. 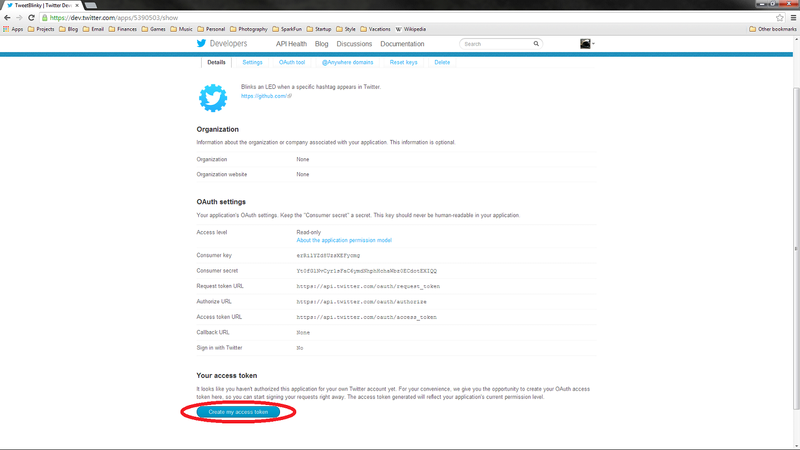 In order for the code to interact with your Twitter account, you will need to register your application. This is accomplished by going to https://dev.twitter.com/. Now you need to edit the code on your PI at line 22 to include your twitter keys. 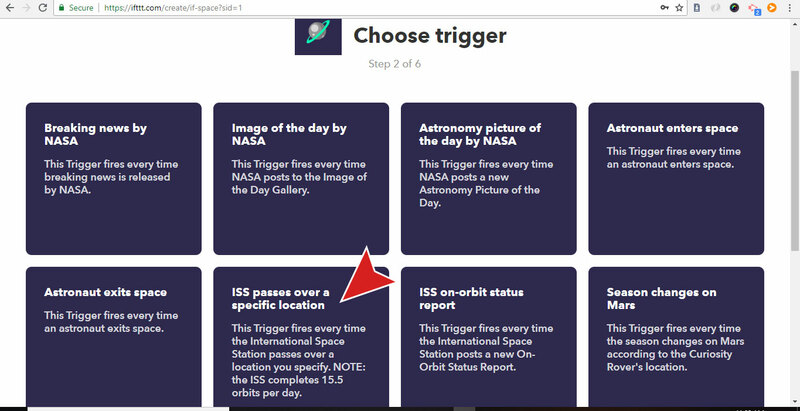 We will now create the IFTTT applet that will post a tweet to your account when the ISS is over the lat&lon you specify. 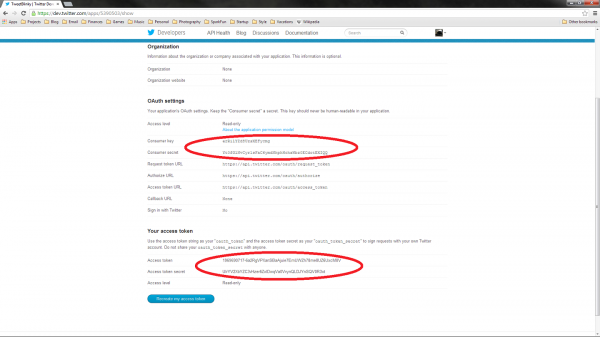 When the tweet is posted with the user specified #hashtag such as #ISSovermyhouse the code running on the PI will pick this up and flash the LED..
Head over to IFTTT and create a new account. 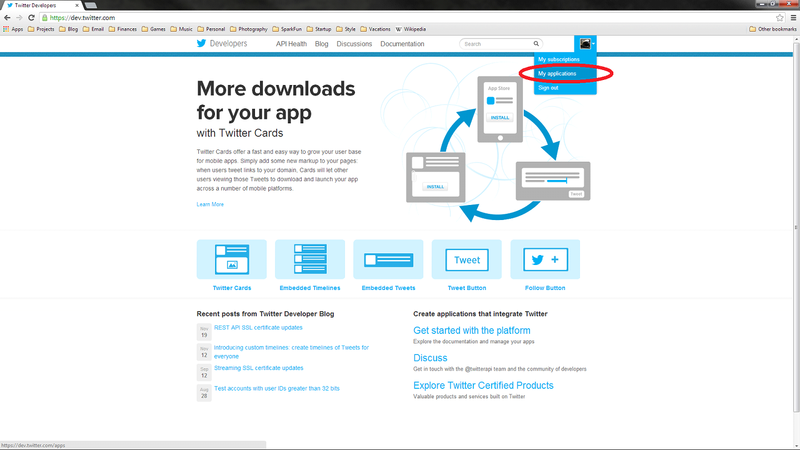 Search for ‘Space’ in the search bar and click the below applet. Select your location by moving the black pin on the map to where you you want the alert to trigger. Now we create the ‘That’ part of If This Then That. So if The ISS flys over your location ‘Then’ do ‘That’ which is post a tweet to your account. Select ‘Post a Tweet’ service. 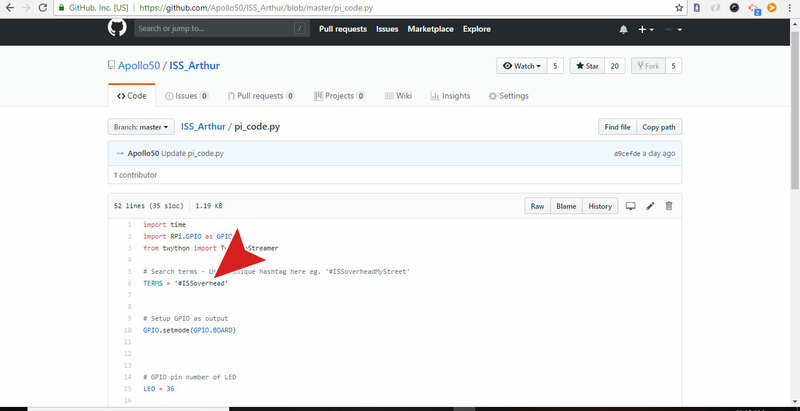 Now you need to edit the python code on the PI on line 6 where it says TERM=’ISSOverhead’ this is the hashtag that the PI is going to search Twitter for 24/7. 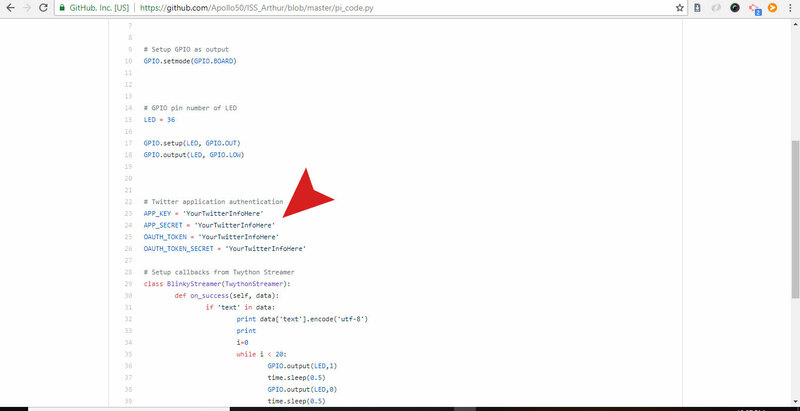 I was amazed how quick the PI picked up the hashtag when it was posted literally instantly. 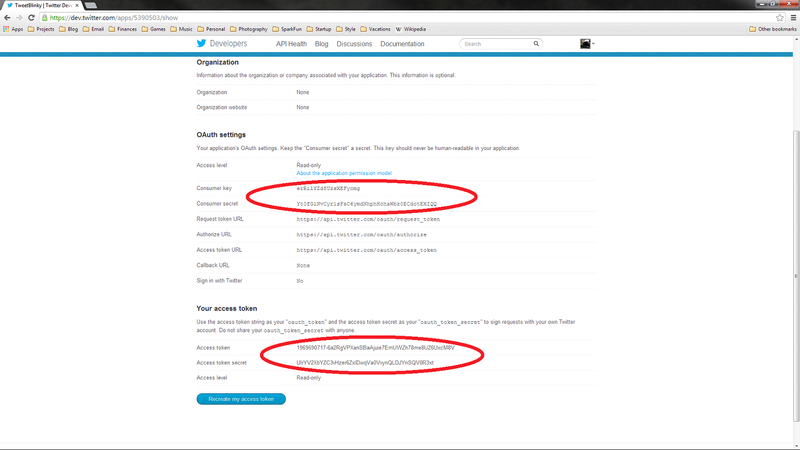 Now add that hashtag to the end of the applet details as below. 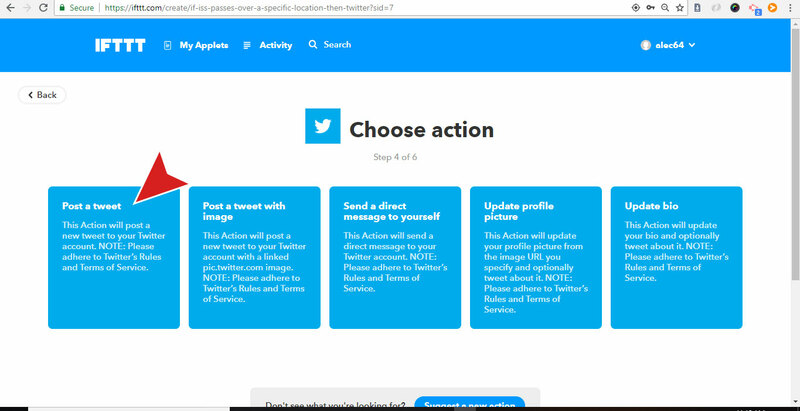 Thats it…make sure the applet is on as below and as long as the code is running on the PI when the ISS passes overhead the applet will run on IFTTT tweet your hashtag and light up Arthur…To test it you can post any tweet with the hashtag and it should light up. 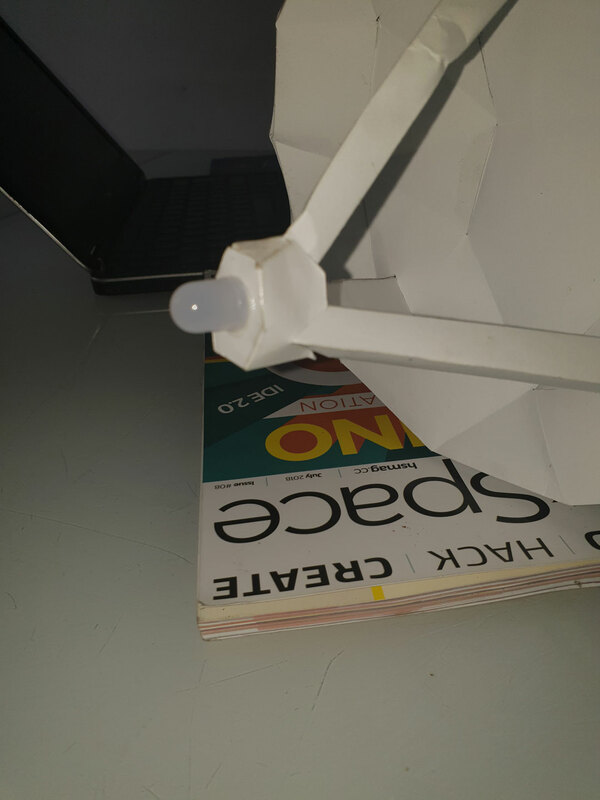 Thats what i love about this project is that it opens up your imagination to the internet of things and causing physical actions in the real world that dont require you to look at a screen!. 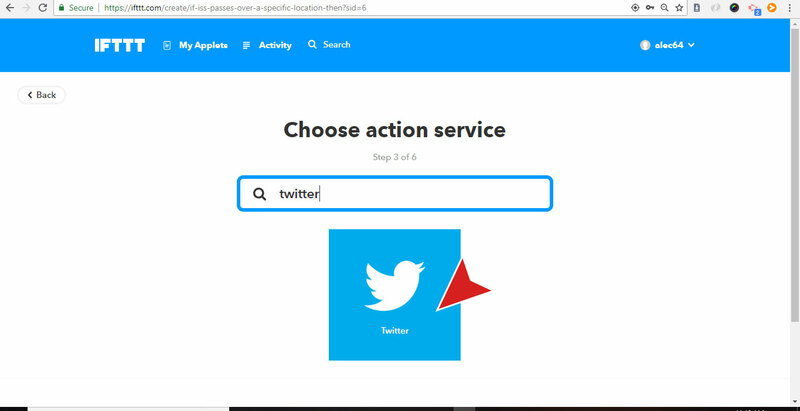 I would like to thank Sparkfun for their tutorial https://learn.sparkfun.com/tutorials/raspberry-pi-twitter-monitor which inspired me to create this. 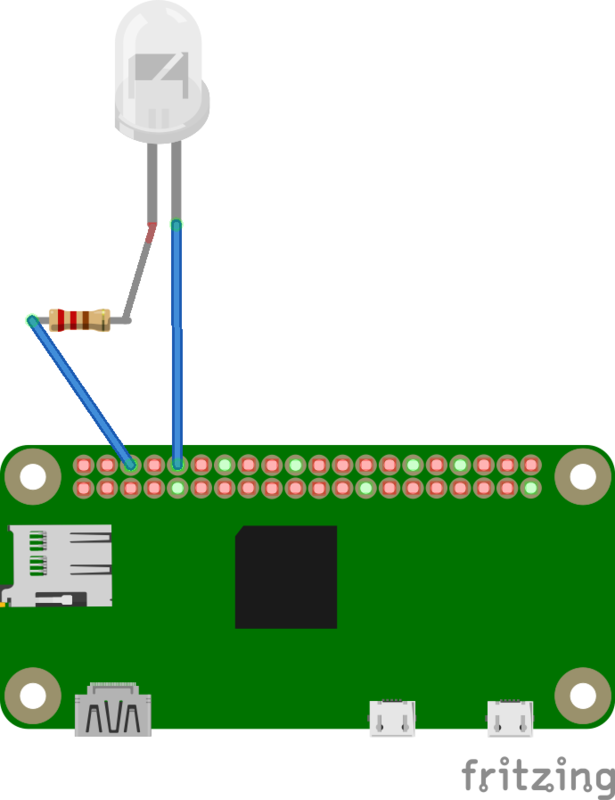 I would also love to create a V2 that plays the audio snippet in the github using https://shop.pimoroni.com/products/speaker-phat. Ive bought the speaker but haven’t had the time recently to write the code. The space station looks like an airplane or a very bright star moving across the sky, except it doesn’t have flashing lights or change direction. It will also be moving considerably faster than a typical airplane (airplanes generally fly at about 600 miles (965 km) per hour; the space station flies at 17,500 miles (28,000 km) per hour), so its location changes really fast! Where is it right now?